SOAR – established in 1982 - has opened up the world to 10,000 fearful fliers. This program is now available as an app created by the leading authority on flight phobia: author, airline captain and licensed therapist Tom Bunn, M.S.W., L.C.S.W. Other approaches offer partial answers. SOAR provides a complete answer - even for extreme cases - by controlling panic, claustrophobia, and anxiety automatically. 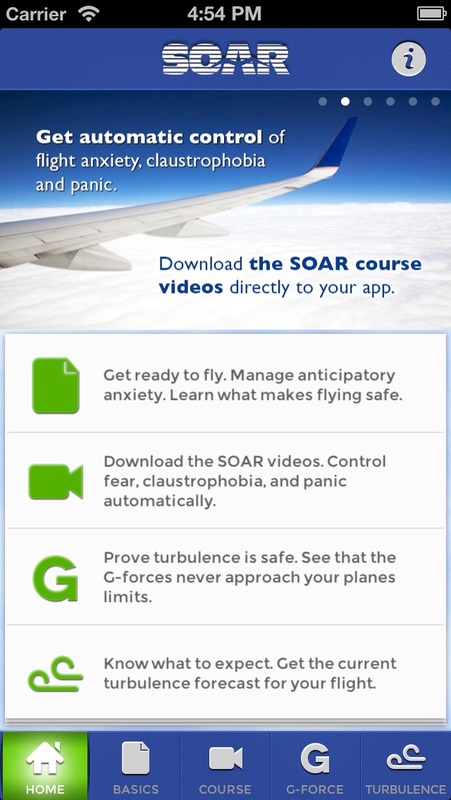 App Features • The G-Force meter proves - in turbulence - that there is no threat to the plane. • Get immediate access to weather information and turbulence forecasts. • Become an expert in how flying works and how safety is maintained. • Know how back-up systems - and back-ups to the back-up - are activated if needed. • Learn about safety systems that prevent pilot error. • Download "Take Me Along" and let Capt. Bunn coach you step-by-step through the flight. Main Menu • Basics • Course • G-Force • Turbulence Forecast Why no panic button? The panic button on other apps is nothing more than a recorded message. With SOAR, no panic button is needed. SOAR is uniquely effective. It allows anxious fliers to fly as others do by controlling panic, as well as claustrophobia and anxiety, automatically. Why no hypnosis? Hypnosis is an inadequate answer. Like relaxation exercises, hypnosis can help you achieve a relaxed state in a quiet, secure, and comfortable environment. It cannot produce or maintain that state in flight, which is a completely different environment. What Others Say About This Program I've been home for a week; I still feel a profound sense of personal power---a feeling of competence. I feel more centered. I keep waiting for this feeling to disappear but thank God, it hasn't. I don't really understand the internal psychological process that your SOAR course affected within me; however, I know it happened. I feel almost as good and comfortable about flying as I did prior to my fear of flying days. And if this could happen to me, I know the SOAR course can work for anyone. == Until I had taken SOAR I absolutely did not travel by airplane or step into an elevator because of being confined to small areas and the feeling of being trapped as well as the fear of not being safe. Now I don't even think twice about it! The course absolutely works. . . . Thanks for the enlightenment. Boldly going where I've never gone before! === Your course has been wonderful so far! It is so easy to follow and understand. I actually am looking forward to flying in two days! Thank you so much for SOAR - I'm glad I've discovered it! === There are no words to describe the impact. I cried, laughed, and sometimes my mouth just gaped open at hearing such new, concrete information about fear and fear management. Some of this information has affected all aspects of my life. Sound dramatic? It has been. Unbelievable. Unforgettable. And impossible had it not been for SOAR. I only wish I had found you sooner. I was given your name by a client who took your course to help his occupation as a rock-n-roll tour manager. I said if it can help him, why not give it a shot? Many thanks for my new life. === Two years of psychotherapy couldn't get me into the air, but SOAR did. Your course has helped me acquire renewed personal confidence and pride. After my second child ( a 9 year old by now) I had develop fear of flying I don't understand why but it happens to me. Every year flying was a nightmare , for the past two years we decided to go on a cruise for our family vacation because of me. Last summer I have to travel from Puerto Rico to Chicago for a business travel on my own. Ar first I was excited for the trip but when I realized that it was a 5 hour flight ( never flew that far ) I was desperate and anxious because I would not have my husband on my side to support my breakdowns when Im flying. A week before I start looking for information about fear of flying and Thank God I found this article about the owner of the application ( a retired pilot ) .. I download the app, start reading the articles , videos etc... I put in place everything that the pilot suggest.. the first two hours of flight were very difficult for me , but Keep practicing and practicing , my mind was fighting against my fears.. and suddenly after 2 1/2 hours of flying , my fears disappear..I can't even explain what I felt in that moment.. it was the most important moment in my life, I felt that know I'm in control of my thoughts and fears. Since then , there's a new me. Fear of flying is my past. Full recommended!!! Won't fly without this app! Need to update to link to appropriate NOAA page. Read the book. Got the app. Completed first flight in over 40 years! This app is great. Whenever im flying and become fearful i just take out soar and it shows me im in the safe zone. Thank you so much captain tom. Thank you for this fabulous APP!!!! I was able to fly to San Francisco applying all my "tools." The flight there was smooth and that really was not fair in stating it all worked. However, the flight back to Houston was very turbulent and I applied all my tools and consistently looked at my G-force tool which calmed my nerves immensely. Thank you again. This program has been a life saver!! I missed out on so much before this program but never will again! The app is icing on the cake! Very well laid out, and very professionally done. The G-Force detector and Turbulence portions of the app are alone worth downloading for, even if you don't have a significant fear of flying. Of course, the tips and exercise info is invaluable to have with you right on your phone/iPad during flight! I haven't tried the in-app purchases yet, probably since I already own the videos, but I'll have to see how that works as an existing member. Overall, great job on the app, and a great program to be in as well. Thanks! 5 stars from me. A fantastic tool. The app is very well made, and presents Capt Tom's program in an easy to follow fashion. I have personally seen the results of his courses. There is a reason why he is a leader in this field. Great app!